a battlefield strewn with corpses may be the safest place to avoid detection by the enemy. Neither would the enemy expect to find too many survivors amongst the dead ones nor would it want to waste time and energy looking. 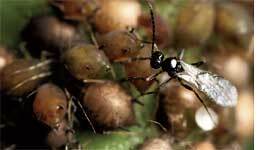 This behaviour is also exhibited by aphids, and wasps that parasitize them. Researchers from France found that aphids do not take flight after their colony is attacked by a wasp. Rather, the wasp changes its hunting strategy and the wingless form increases in number. This is counterintuitive as one would expect more winged offspring so they could fly away to escape predation. Cereal aphids which feed on the sap of grain plants come in two forms: winged and wingless. When wasps attack the aphid colony, they kill and feed on the aphids but leave behind the outer skins. These empty shells are called aphid mummies. The researchers set up experiments where they exposed the aphids and the wasps to different densities of mummies (0-4) on the same plant and neighbouring plants. When the number of mummies increased, the aphids produced more wingless offspring and the wasps visited the plants much less. The presence of dead aphids caused wasps to reduce their visits to these plants and focus on unexploited plants where the number of healthy aphids would be higher. The living aphids produced more wingless offspring which continued to live among the mummies. The wasps avoided these areas and the wingless aphids were safe. The experiments were set up such that the aphids could not see the mummies. This suggested the mummies exuded chemicals which worked as signals. The chemical is as yet unknown, said the authors in the study published in the February 12 issue of Behavioural Ecology.